Made from 12.5 mm x 120 mm tongue and groove shiplap board on 44 mm x 29 mm planed framework. 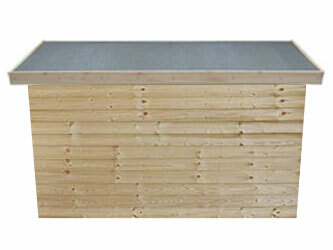 The roof and floor are 12.5 mm x 120 mm tongue and grooved V-board with the roof being top-hinged with three tee hinges and a 4" overhang all round. Available in 3 sizes: small with 2' front and 2' 6" back heights; medium with 2' 6" front and 3' back heights; and large with 3' front and 3' 6" back heights. These are supplied untreated: treatment is an optional extra.